Why even bother when you have those nice AJAX File Upload thingies with progress bar? There happens to be a lot of misunderstanding about this, so let me make it clear to all: There is no such thing as an “AJAX File Upload With Progress Bar”!. The XHR Object just does not support this! The only AJAX that might ever come in these are the periodical calls to a file that returns the current size of the file that is being uploaded. “Upload Progress Meter” immediately falls out of the boat since it requires a patched version PHP. FileChucker also gets ditched since it’s not PHP but Perl and it’s not that easy to customize (Above that I noticed that you now have to pay for this version). Same goes for tesUpload: it’s Perl! RAD undergoes the same faith since that’s Java, leaving us only with “PHP Upload Progress” by devpro.it, but that ain’t AJAX either … it actually is a port of the ActionScript LoadVars Class. Above that I have found it buggy most of the time. A very nice way of uploading files is through Flash. Since the release of Flash 8, the FileReference Class has been introduced which enables this all. Progress bar due to the onProgress Event! Ability to define how big a file is, even before it is uploaded! Above that you also benefit from the Rich flash features … if you’re tired of the lousy input[type=file] element then this is something for you: no graphical limits whatsoever! Other than the fact that Flash 8 (not 7 nor 6, but 8!) is required there also is a problem with the onComplete Event of the FR Object: it is not able to read the result that is outputted. In a situation where you’d want to read in a generated filename of the upped file (after is has been uploaded), you won’t be able to do it unless you generate the name in flash itself (or maybe get it from a generationscript via LoadVars). The onComplete event only checks if the target of the upload has been found or not. In layman’s terms it comes down to this: either return a 404 when the file has not uploaded, or return a 200 when it has succeeded. Another issue is the fact the flash opens it’s own connection and does not take over your active session. This is obvious, yet in some situations it is not wanted. Solution to this is passing in your session params to the swf via the flashvars. Clicking the Add new download link results in a Lightbox alike overlay to appear. The overlay holds the form, and a hidden iframe. The target of the form is set to that hidden iframe. When the submit button is pressed, the form is locked, and the close button of the overlay disabled.The upload is in progress to the hidden iframe. Wasn’t that the WordPress way you just described? No it wasn’t. 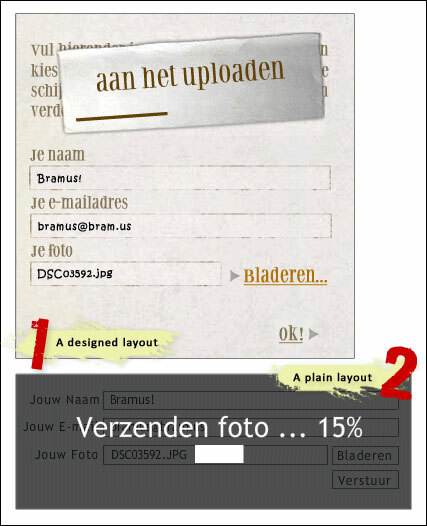 In the WordPress admin the whole file upload form is placed inside an iframe and it behaves in a normal way. See it as the iframe having the form as a child, whereas in the method described the iframe is a sibling of the form. Any other methods worth mentionning? The reason that it doesn’t just create a new element and copies the value into it is quite simple: when having an input[type=file] element one cannot simply set its value due to security reasons. Just imagine if it were possible: one could create a hidden form, set the value of the file element to any file (lets say your SAM File which "holds the user names and password hashes for every account on the local machine, or domain if it is a domain controller") and then let it automatically submit. Strange that you haven’t metioned SibSoft’s XUpload script. We used it in our projects and I believe it’s one of the best. yes SibSoftâ€™s XUpload script is the best, I’ve had a seminar about that and it really works.. the best for me.